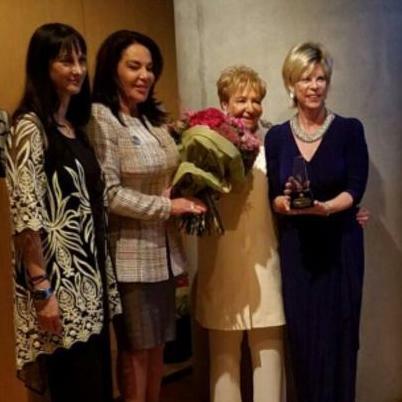 L to R: Elena Kountoura (Greece, Minister of Gender), Honorable Katerina Panago (Greece, Executive Global National Ambassador to the Council of Europe for Sports), Loula Alafoyiannis (EAWC, Founder), and award winner Dr. Terry Neese (IEEW, Founder & CEO). Artemis remains one of Greece's most celebrated goddesses: she was Appolo's twin and equal, a huntress, and the protector of young girls. So it makes sense that the European American Women's Council (EAWC) headed by Loula Alafoyiannis would name their annual award for women in her honor. I was thrilled to be one of many global trailblazers selected to receive this year's award. Read more about the awards and the beautiful Greek backdrops we were lucky enough to see in the festivities: click here. I traveled abroad thanks to the EAWC and Loula along with friend and IEEW volunteer Pat Carr and fellow Oklahoman award winner Victoria Woods (ChappellWood Financial, CEO). It was an unforgettable trip to Greece, a place dear to my heart for many years. Having the opportunity to join up with other global entrepreneurs is the beating heart of the PEACE THROUGH BUSINESS(r) program. The spark made in the conversations held on these trips abroad may hold the potential to take our program to the next level. We are always looking for ways to build the road to peace into new lands and link our hand with a diverse group of women. Women together are unstoppable: I've said it once, and I'll say it again and again until gender equality has been reached. PS: A leader's work is never done! After returning on Wednesday from Greece, I unpacked and then re-packed my bags to speak at NAWBO's annual conference on "Creating Leaders for a World of Change". It is always a joy and feels like going home to reconnect with the organization I once helmed. NAWBO for life! We signed an MOU while I was there, making official the mentorship partnership between our two organizations. To get involved as a mentor to the Class of 2018, fill out the application here. [VIDEO] The Afghan Ambassador, Hamdullah Mohib, honored us with his kind words about PEACE THROUGH BUSINESS(r) this summer. Keep up with #peacethroughbusiness! Follow us on Facebook. We need your help to train more global entrepreneurs. We rely 100% on private donations. Donate now. Click here to help us pave the road to peace.